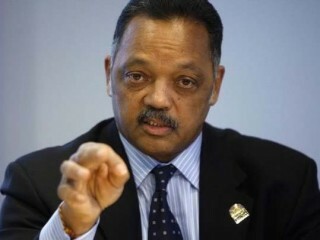 Jesse Louis Jackson, Sr. (born October 8, 1941) is an American civil rights activist and Baptist minister. He was a candidate for the Democratic presidential nomination in 1984 and 1988 and served as shadow senator for the District of Columbia from 1991 to 1997. He was the founder of both entities that merged to form Rainbow/PUSH. Representative Jesse Jackson, Jr. is his eldest son. In an AP-AOL "Black Voices" poll in February 2006, Jackson was voted "the most important black leader" with 15% of the vote. Known throughout the world as a human rights activist and in the United States as a fighter for racial equality, Jesse Jackson is a staunch politician and an outspoken supporter of improving conditions for the working class and poor. He has earned his place as one of history’s most prominent leaders for his work at home and abroad. He has personally been responsible for the release of several POWs held in other nations, and has rejected Bush’s international policies from the beginning. Born in South Carolina, Jackson played sports and participated in American football at the University of Illinois and at North Carolina’s AT&T University. Although he is an ordained Baptist minister and has earned a Master’s degree in Divinity, he didn’t complete his studies at the Chicago Theological Seminary. Jesse Jackson is best known for his participation as a leader of the civil rights movement. Jackson supported Martin Luther King, Jr. in all he did and was present the moment of his assassination. As the years progressed, Jesse had to end his work with King’s organizations due to a falling out with other leaders. He then started his own group, which was dubbed Operation Push. This was later combined with the Rainbow Coalition. Jackson ran for president twice in the 1980s, once in 1984 and another time in 1988. While he won several votes in the south, it wasn’t until his later running that he was better funded and organized. He surprised the nation when he won eleven primaries and especially when he won the Michigan primary with 55% of the vote. His popular Rainbow Coalition stood for the rights of everyone, no matter their skin color, religion, ethnicity or sexuality. He has been considered by many as one of the most liberal nominees ever running for president. In the biography of Jesse Jackson entitled America’s David, the author states that Jesse was always accepting of everyone around him, and that he was a fierce competitor in school politics and sports, always wanting to be number one. Bill Clinton awarded Jesse Jackson the Presidential Medal of Freedom for his work at home and abroad. Jackson supported Bill Clinton’s running for president, but did not voice his support for Al Sharpton or Senator Braun, who were running for the 2004 presidential race. On June 23, 2007 Jackson was arrested in connection with a protest at a gun store in Riverdale, a poor suburb of Chicago, Illinois. Jackson and others were protesting due to allegations that the gun store had been selling firearms to local gang members and was contributing to the decay of the community. According to police reports, Jackson refused to stop blocking the front entrance of the store and let customers pass. He was charged with one count of criminal trespass to property. In March 2007, Jackson declared his support for then-Senator Barack Obama in the 2008 democratic primaries. Jackson later criticized Barack Obama in 2007 for "acting like he's white," in response to the Jena 6 beating case. On July 6, 2008, during an interview with Fox News, a microphone picked up Jackson whispering to fellow guest Dr. Reed Tuckson: "See, Barack's been, ahh, talking down to black people on this faith-based... I want to cut his nuts out." Jackson was expressing his disappointment in Obama's Father's Day speech chastisement of Black fathers. Only a portion of Jackson's comments were released on video. A spokesman for Fox News stated that Jackson had "referred to blacks with the N-word" in his comments about Obama; Fox News did not release the entire video or a complete transcript of his comments. Subsequent to his Fox News interview, Jackson apologized and reiterated his support for Obama. On November 4, 2008, Jackson was present at the Obama victory rally, waiting for Obama to appear. In the several moments before Obama spoke, Jackson was in tears. View the full website biography of Jesse Jackson .